Election day is drawing near, and we face important decisions. 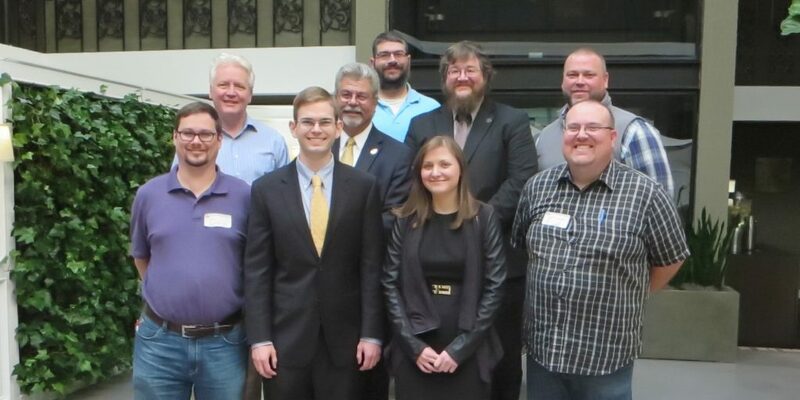 Voters will have choices in many races that include Libertarian candidates. In fact, Libertarians represent the only alternative in many races. In three of Arkansas’ four congressional districts, Libertarians are the only candidates challenging Republican incumbents. Only 34 of 100 state house seats are contested at all in this election, and 10 of those races would be uncontested if it weren’t for Libertarians. A vote for a Libertarian is a vote against the status quo. The major political parties have failed us in their policies and in the candidates they have put forward to represent us. They have presented us presidential candidates who are not only detestably corrupt, but who are also intending to expand the rule of the imperial presidency in our lives and around the world. The Libertarian candidate for President, Gary Johnson, is the only sane, sensible choice in this race. He has more executive experience than any other candidate, and he has the demeanor to be a president, rather than a ruler. He is the only candidate addressing the overwhelming national debt, talking about protecting our civil liberties, and questioning the effectiveness of our interventionist foreign policy. He deserves your vote for those reasons alone. But also consider this: Arkansas’ electoral votes are not really contested – the Republican will win this state. 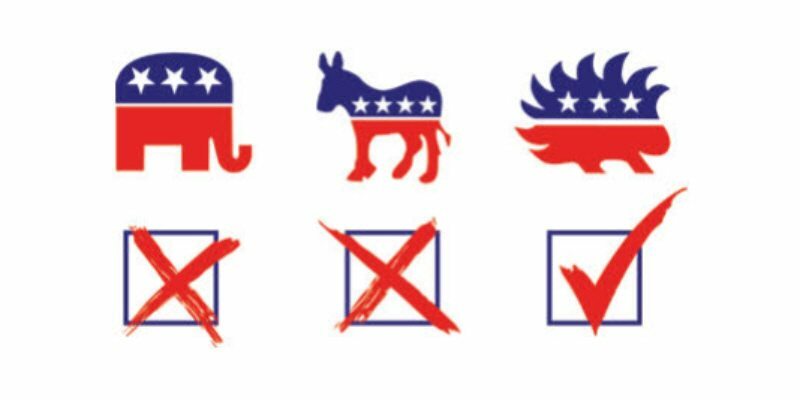 So a vote for one of the two major party candidates will not change the outcome of the election, but a vote for the Libertarian will assure that voters have more choices in the future. 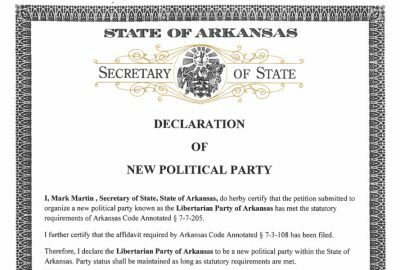 Because of the quirks of Arkansas election law, a vote for Gary Johnson will help keep the Libertarian Party on the ballot in the future. 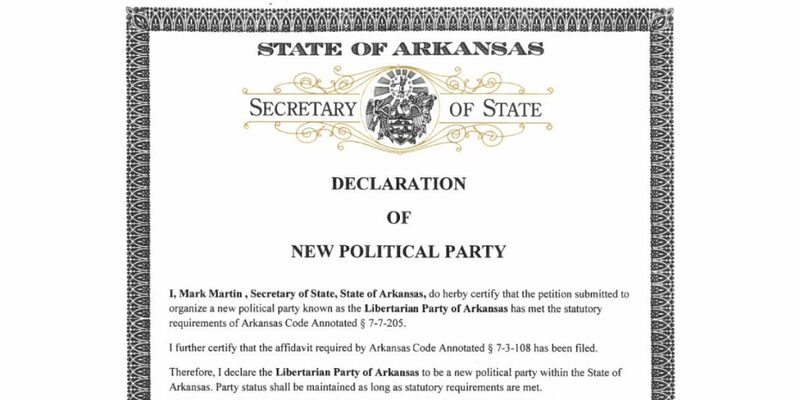 Regardless of how many candidates we run or how many votes they earn in the election, the Libertarian Party of Arkansas will remain an official political party only if our presidential candidate receives 3% of the vote. Libertarians are fielding candidates up and down the ballot, presenting the voters with choices where none would otherwise exist. If you vote for a Libertarian, you are voting for someone who will always choose more freedom over less, who will always advocate less government rather than more. 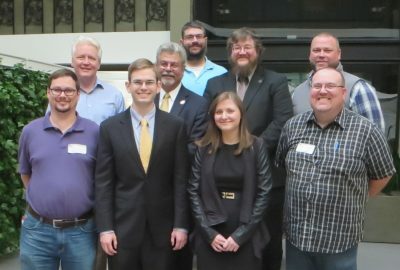 Libertarian candidates are not beholden to special interests or for sale to the highest bidder – we are ordinary citizens trying to make a difference. When you look at the current state of affairs at all levels of government, when you look at the problems that the Republicans and Democrats have created or left unsolved, could Libertarians do any worse? Give us a try. This time, vote Libertarian.